Meme: And the memes continue! Three things from books (images, ideas, characters) that really snagged your imagination. Do you have a set reading time (before bed, perhaps)? Do you read more at night or during the day? Is there a day of the week, perhaps, that you set aside to catch up on reading? I had read Dickens’s Great Expectations back in November/December and wasn’t thoroughly impressed by it; it was okay but I found myself trudging through a good part of the novel. I figured after a while that I probably wasn’t in the right headspace at this time to read Dickens and decided to come back to his works later on. 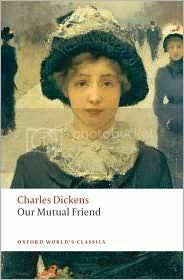 However, I watched the 1998 BBC adaptation of Our Mutual Friend recently and absolutely fell in love with the story so I decided to check the book out as well. And I rather enjoyed it. I heard wonderful things about Maguire’s Wicked but I dunno, I thought it was okay, nothing spectacular. I’m also currently re-reading Kostova’s The Historian to see if my opinion will change; I love the research and the history but I found the writing and the plot rather dry and way too drawn out…maybe a second read will change my mind? 13. Any “required reading” you hated in high school that wasn’t so bad ten years later? Ehh, haven’t re-read all of the books I’ve read in high school. One story I do have is that I read Pride and Prejudice in Grade 11 and didn’t think much of the book at the time (had to write an ISU essay on the book, that’s why—it was my favourite from the batch that year though). I decided to re-read it again when I was in first year university (especially with the movie coming out and everything) and fell in love with it completely. So it was more of a meh to yay reaction rather from hate to okay kind of thing. Don’t really have an opinion on this one, I don’t read his stuff. Eragon—five seconds into the movie my brother and I already started poking fun at it. That was not good; it totally destroyed whatever interest I had in the books to begin with (and I did read the first book).